The gradual effects of Alzheimer’s and dementia can cause stress within a family. As a premiere Orlando dementia care agency, the Partners in Healthcare team knows what’s needed to make life easier for seniors with dementia. Our Orlando dementia care managers understand that each client needs are unique and their disease will have varying impacts on their memory. That’s why each care plan is customized to the individual, and also personalized to the needs of their family. Our RN care managers work hard to find a great caregiver match for you and your loved one, because the right person and a structured routine can improve challenging behaviors and greatly increase the client’s quality of life. Alzheimer’s disease typically begins with very mild cognitive impairment and progresses into more significant memory loss and confusion. The senior care experts at Partners in Healthcare have compiled a list of warning signs that for families concerned that a loved one may be exhibiting symptoms of Alzheimer’s disease. 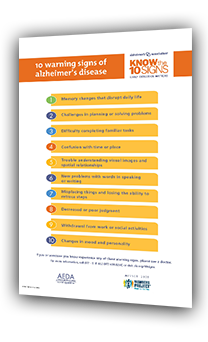 Fill out the short form on the right to learn more about the 10 warning signs of Alzheimer’s disease.